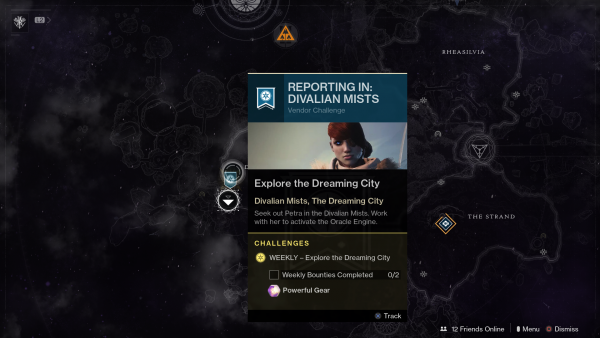 It’s Week 6 of the Ascendant Challenge, so let’s see what’s in store before the playlist resets. Petra Venj has moved right beside the Divalian Mists drop zone so you won’t have to go careering through tunnels to find her. 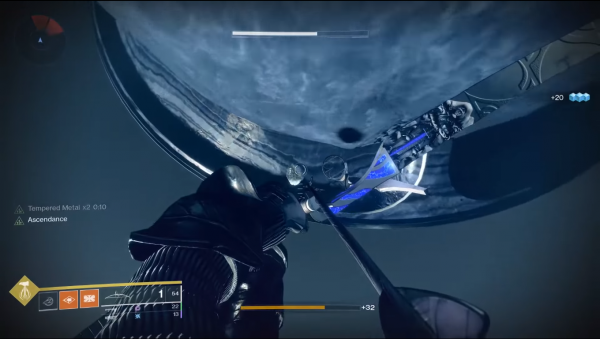 As ever, you’ll need at least one Tincture of Queensfoil to activate the Ascendant buff to complete the challenge. We’re also going to look at where to find the three Taken eggs and lore for this week’s challenge because we want to help you complete as many Triumphs as possible. This Ascendant Challenge takes place in the Cimmerian Garrison, so what you’ll want to do is head over to Rheasilvia. Come out of the cave and just before you cross the bridge, jump down off the cliff to the right onto the platform below. 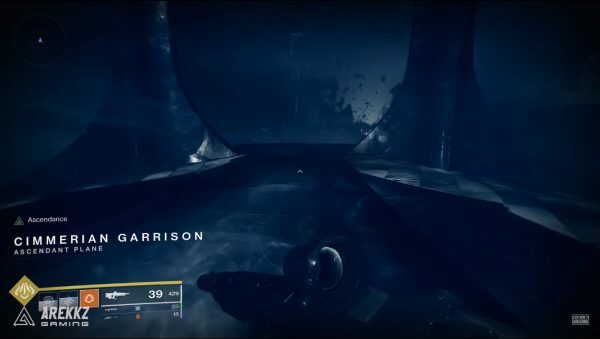 Hug the wall to the right and you’ll find a Lost Sector, the Chamber of Starlight. Work your way through the Lost Sector until you come to a large, open room with two snipers at the back. This is where the portal will appear. Jump into the portal to begin the Ascendant Challenge. You’ll be transported to the Cimmerian Garrison. It’s basically like running a gauntlet and you can easily avoid enemies if you have a high enough Power level. Otherwise, we’d recommend bringing a sniper rifle, a shotgun and some kind of rocket or grenade launcher. Follow the path, killing or avoiding enemies as you go, until you find a glowing orb. Like last week’s challenge, the orb will guide you across some floating platforms. Some of these platforms begin to rotate and take care not to jump through any holes in the platforms. Once you’re far enough along, you’ll encounter some Shriekers and a Taken Knight. The Shriekers will respawn so they shouldn’t be your main focus, so try and take out the Taken Knight as soon as possible. Watch out for Taken Phalanx as well as they might shove you off the platform and you’ll have to start again. On the final platform, there will be two Taken Knights to defeat to complete the challenge. These are the only two enemies you really need to kill to complete the challenge, so it’s up to you if you want to try and wipe out all the enemies leading up to this point or not. A chest will spawn upon defeating the two Knights and the challenge is complete. After you’ve defeated the four Taken Phalanx that spawn, the path will split in two different directions. Take the left instead of the right and follow the platforms until you find the lore bones at the end. The first egg is at the start of the Chamber if Starlight. Walk through the first archway and peek over the edge to your right and you’ll see it glowing below. Shoot it to destroy it. The second egg is just before the spiral staircase section. On your way to it, once you drop on a circular plate that connects you to the next part of the challenge, look up to the right to see it glowing. The last egg is at the end where you find the boss. The egg is underneath the platform you’re fighting on. 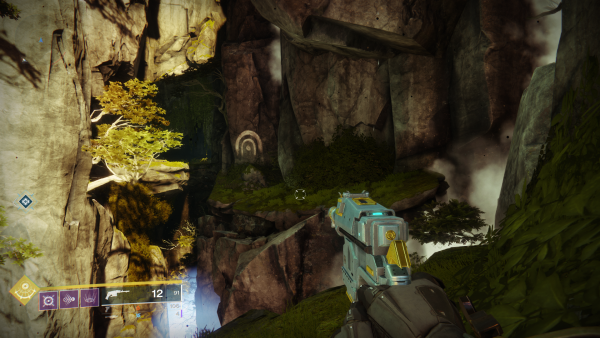 It would be a wise idea to find the lore, the other two eggs, fight the boss and claim your loot before jumping down as many players have found it difficult to jump back up. On the other side of the platform from where you entered, look over the edge and you’ll see the egg. You’ll get a tasty weapon drop and a Triumph once you’ve destroyed all three eggs. Looking to boost your Power levels or find some Exotic weapons? Check out our Destiny 2: Forsaken guide for tips, tricks and walkthroughs. The Draw Exotic quest is now live and the Crimson Days event is about to begin, so grab a pal and jump into the Crucible.